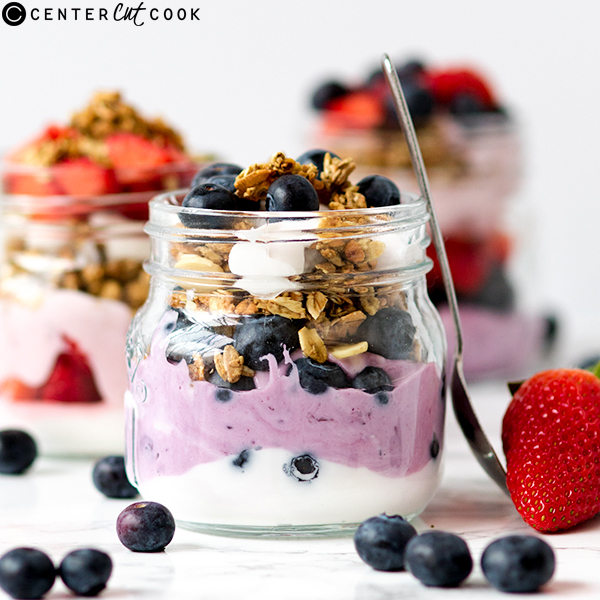 A light and creamy parfait that makes a luxurious breakfast or a snacksational after-school treat! These breakfast parfaits though? Delicious, dessert-like AND healthy! 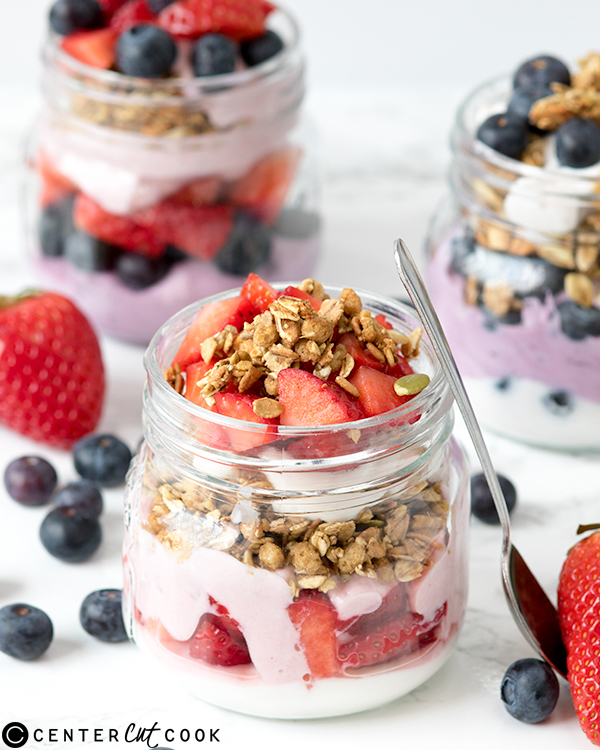 Made with Yoplait Light yogurt, a little crunchy granola and fresh fruit, they’re perfect for a waist-line friendly breakfast on the go. Spoon it all into a cute little mason jar, screw the lid on and throw it in your bag for a breakfast or snack you can look forward to when you get to the office. I made three fruit combinations using Yopait Light Blueberry Yogurt, Strawberry Yogurt and Very Vanilla Yogurt all found at my local Jewel-Osco. The first I had for breakfast, and then I placed the other two in the fridge, thinking I’d save them for the next day. That was never going to happen once my two hungry kids got home from school though! The look on their faces when they opened the fridge door and spotted those two parfaits? There was no way I was winning that one. Ideally they should be made and eaten the same day (to prevent the granola going soft). If you want to make them the night before, just leave out the granola and wrap it up in a little bag. Then you can sprinkle it on top when you come to eat it. I’ve got my eye on the red raspberry and banana cream pie yogurts for my next parfaits – if I can get to them before the kids that is! This is a sponsored conversation written by me on behalf of Albertsons and Jewel-Osco. The opinions and text are all mine. Spoon 2 tbps of Yoplait Light Very Vanilla Yogurt into an 8oz mason jar. Top with 2 tbsp chopped strawberries, followed by 3 tbsp Yoplait light Strawberry Yogurt. Add 2 tbsp granola, 1 tbsp Yoplait Light Very Vanilla yogurt and 1 tbsp of chopped strawberries. Top with 1 tbsp granola and serve. Top with 2 tbsp blueberries, followed by 3 tbsp Yoplait Light Blueberry Yogurt. Add 2 tbsp granola, 1 tbsp Yoplait Light Very Vanilla yogurt and 1 tbsp of blueberries. 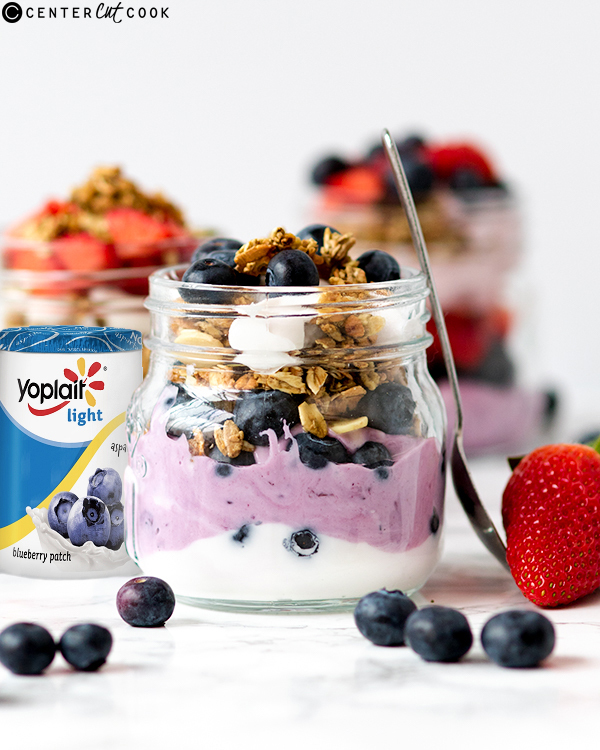 Spoon 3 tbps of Yoplait Light Blueberry yogurt into an 8oz mason jar. Top with 2 tbsp mixed blueberries and chopped strawberries, followed by 2 tbsp Yoplait Light Strawberry Yogurt. Add 3 tbsp granola and 1 tbsp Yoplait Light Strawberry Yogurt. Top with 2 tbsp mixed blueberries and chopped strawberries and serve.